From the smell one would assume this would be a very malt-heavy beer and lacking on the hops but one would be wrong. The flavors found in the smell are also very present in the taste with sweet bready malts hitting the tongue first followed by those dark candied fruits like figs and prunes. Then the hops come into play with a commanding citric-pine spiciness. For the remainder of the beer the flavor passes from brown-sugar sweet to citrus-zest bitter while the hops and malt fight for dominance. The finish is both dry and slightly sweet leaving your taste-buds ready for the next drink. Appearance: Very attractive beer with a burnt amber color and bright copper highlights. Has a hazy clarity with a generous amount of off-white head. The fluffy two-finger head slowly faded into iceberg-like clumps with a sticky ring of lace that lasted the entire beer. Smell: There is no mistaking what this beer once you smell it. The initial scents are unmistakably dark fruits and molasses. While there is a faint hoppiness it is overpowered by the sweet spices. Overall a very sweet but nice smelling beer. Initial Taste: From the smell one would assume this would be a very malt-heavy beer and lacking on the hops but one would be wrong. The flavors found in the smell are also very present in the taste with sweet bready malts hitting the tongue first followed by those dark candied fruits like figs and prunes. Then the hops come into play with a commanding citric-pine spiciness. For the remainder of the beer the flavor passes from brown-sugar sweet to citrus-zest bitter while the hops and malt fight for dominance. The finish is both dry and slightly sweet leaving your taste-buds ready for the next drink. 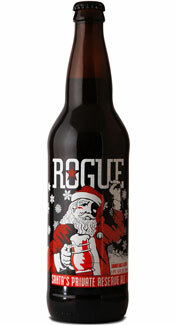 Thoughts: Santa’s Private Reserve Ale is Rogue Brewery’s winter offering. Unlike most winter seasonals this is not a winter warmer. Instead Rogue took their Dry Hopped Saint Rogue red and varied the recipe adding double the hops to make this a hopfilled warming winter red ale. Since this is at it’s core a red ale, the flavor is dominantly sweet with molasses and bready malts. However there is a fair amount of hops in the equation to help tame the sweetness enough to make this beer a wonderful session ale. The bitterness from the Chinook, Centennial, and a mystery hop called Rudolph make this an enjoyable beer for both sweet tooths and hop heads alike. But don’t take my word for it, go try this winter red ale for yourself. Just make sure to let us know what you think! Cheers. Forgot to mention, the label on the 650ml glows in the dark…pretty cool.